Soul of the Duelist is a Booster Pack in the Yu-Gi-Oh! Official Card Game (OCG) and Yu-Gi-Oh! Trading Card Game (TCG). It is the first Booster Pack in the OCG Series 4. It is the first set after the convergence of Japanese Booster Pack releases with TCG, Asian-English and Korean releases. Previously one set of Booster Packs was being released in Japanese, while other languages received separate Booster Packs, which were usually an amalgamation of two of the Japanese Booster Packs. It has been released in the OCG in Japanese, Asian-English and Korean and in the TCG in English, French, German, Italian, Portuguese and Spanish. This set introduced "LV" monsters, including the "Horus", "Armed Dragon" and "Mystic Swordsman" series. It introduced the strongest Fusion Monster in the TCG at the time, "Master of Oz". Soul of the Duelist is one of the four Booster Packs combined into Dark Revelation Volume 3. Due to the convergence of releases, this became the first set TCG, Asian-English and Korean set to follow the Japanese format. This included having 4 Ultra Rare and 7 Super Rare cards in the set, following the Booster Pack color pattern, having cards printed with more than one rarity, namely Ultimate Rare. This is the first TCG, Asian-English and Korean Booster Pack to not contain Secret Rares. This is the first English set to use "EN" in its set numbers (SOD-EN###). A number of earlier sets were later reprinted to follow this pattern too. In the Japanese version, each pack contained 5 cards and each box contained 30 packs. 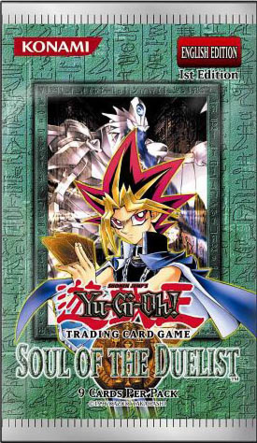 In the TCG and Asian-English versions, each pack contained 9 cards and each box contained 24 cards. In the Korean version, each pack contained 5 cards. This page was last edited on 13 March 2019, at 13:31.